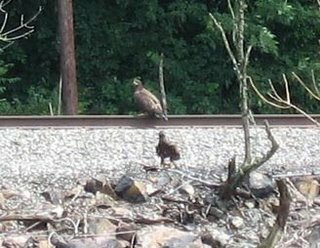 Schodack Creek – two immature Bald Eagles on the east side railroad track (they’re called “immature” because they don’t have the white markings which begin to show at four years of age). This is the track for the high speed Amtrak trains. Eagle mortality from high speed trains is significant. Eagles sometimes eat on “railroad kills” and don’t have the room or speed to get out of the way when trains approach. Posts created by Riverkeeper Patrol are a collaboration of Riverkeeper's boat program staff. 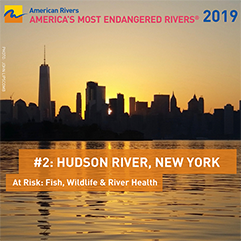 Riverkeeper maintains an enforcement presence on the Hudson River, patrolling the length and breadth of the estuary from south of the New York Harbor to north of the federal dam at Troy.